Did you know that there are some Magento 2 modules available on UberTheme separately from Magento 2 templates? Below, we describe one of the oldest products – the UB Content Slider Magento 2 extension. The module is designed to simplify the way you create various sliders: images, products, or even videos can be effortlessly used to grab the attention of store visitors. Let’s see, what core features the extension has. First of all, it is necessary to mention that the UberTheme UB Content Slider Magento 2 module is fully responsive. It means that the content you promote will be displayed on all screen sizes equally great. Furthermore, you can place several blocks with sliders on a single page. And a slider can be added virtually anywhere with the help of another handy feature – widget module manager. 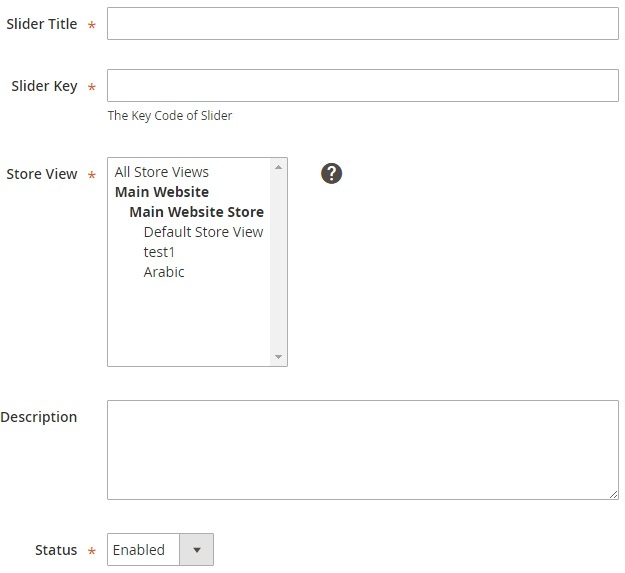 Of course, the UberTheme UB Content Slider Magento 2 extension supports multiple websites with all the consequences: you can customize blocks with content for each store view individually providing users from different countries with the corresponding content in their native languages. And there are 4 different types of display. The module provides the ability to promote latest, hot, new, or random products. The New and Hot products display can be fully customized within the admin page. Furthermore, you can even manage animation effects. From the perspective of a store visitor, the UberTheme UB Content Slider Magento 2 extension supports touch events and the mouse slider features. Let’s dive deep under the hood of of the module and describe its backend appearance. 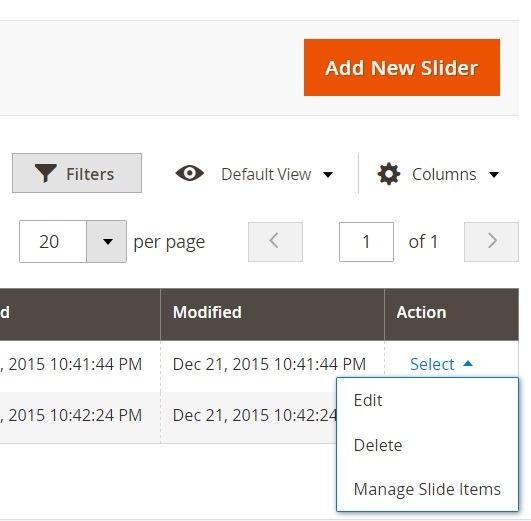 Action – here, you can edit, delete, or manage slide items. If you don’t need some of the mentioned above columns, you can easily hide them via the “Columns” dropdown. Also, note that it is possible to create custom grid views and save them. Moreover, if there are lots of sliders, you can apply filters to find the necessary one. 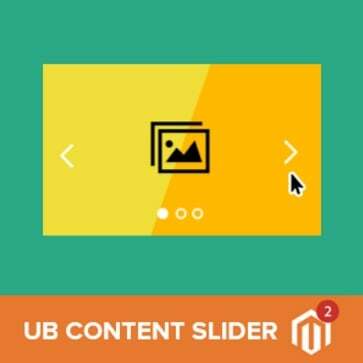 As for mass actions, the UberTheme UB Content Slider Magento 2 module provides the ability to delete, disable, enable, or edit several sliders simultaneously. The Manage Sliders page also allows you to add a new slider. Hit the appropriate button on the right above, and you will be redirected to a new page, where basic information can be specified: slider title, key, store view, description, and status. Save the slider and return to the previous grid. Here, in the Action column, you should select “Manage slide items”. 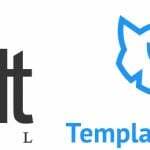 As for other page properties, they are absolutely the same as in case of the previous grid: mass actions, filters, and custom views. Sort Order – create a custom order for slides to be displayed. Although the system with two grids – one with sliders and another with slides – seems to be less effective than a slider configuration section with several tabs, we think that it is more effective, because you can add an unlimited number of slides without turning a slider configuration section into a chaotic mess of images and videos. Now, when you know that the backend interface of the UberTheme UB Content Slider Magento 2 module is user-friendly and powerful enough to create outstanding sliders, let’s look at the frontend appearance of the extension. As for its behavior, it indicates what image from the row is displayed. Besides, it shows the sort order on the main image. And while thumbnails from the row below don’t display any information, the image that is currently displayed gets some new elements: name, description and the “View More” button. Remember we’ve just added a link in the backend slide configuration? It is used in the “View More” button. In our case, the slider displays 2 videos simultaneously. The “View More” link is available beneath each video in addition to a slide name. Thus, the UberTheme UB Content Slider Magento 2 module displays two slides simultaneously, but it may vary depending on a screen size. The pagination is shown below. As you can see, UberTheme UB Content Slider Magento 2 extension is extremely easy to use. You don’t need neither coding nor backend experience to configure the module. Everything is intuitive, so even a child can create a stunning slider (if you provide him or here with great images and videos of course) with the help of the tool. As for the price of the Magento 2 module, it costs only $99, so don’t hesitate to give it a go – it will help you make your Magento 2 website more appealing to customers. Did you know that there are some Magento 2 modules available on UberTheme separately from Magento 2 templates? Below, we describe one of the oldest products – the UB Content Slider Magento 2 extension. The extension is designed to simplify the way you create various sliders: images, products, or even videos can be effortlessly used to grab the attention of store visitors. Let’s see, what core features the extension has. From the perspective of a store visitor, the UberTheme UB Content Slider Magento 2 extension supports touch events and the mouse slider features. Let’s dive deep under the hood of the module and describe its backend appearance. If you don’t need some of the mentioned above columns, you can easily hide them via the “Columns” drop-down. Also, note that it is possible to create custom grid views and save them. Moreover, if there are lots of sliders, you can apply filters to find the necessary one. 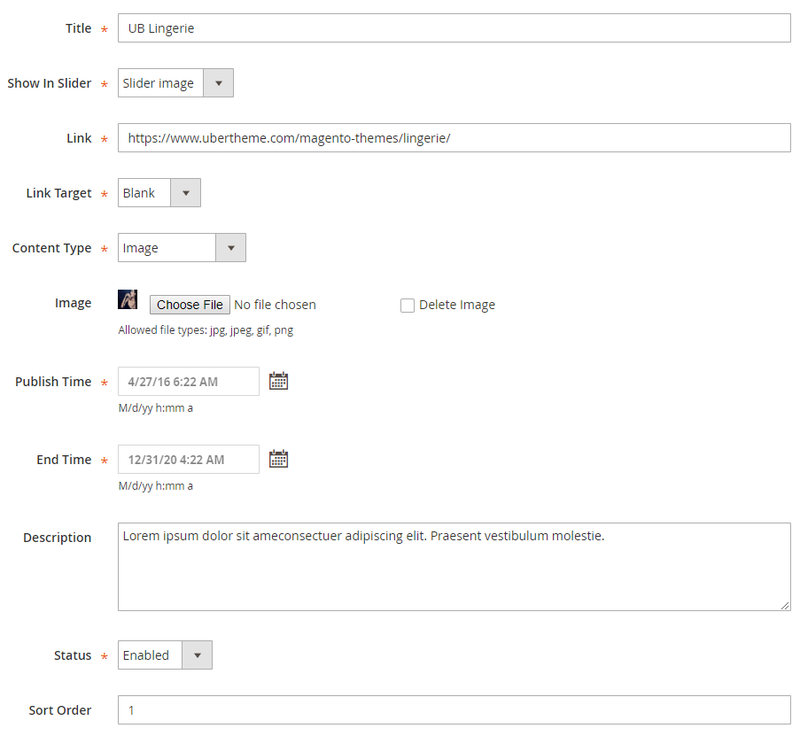 As for mass actions, the UberTheme UB Content Slider Magento 2 module provides the ability to delete, disable, enable, or edit several sliders simultaneously. As for its behavior, it indicates which image from the row is displayed. Besides, it shows the sort order on the main image. And while thumbnails from the row below don’t show any information, the image that is currently displayed gets some new elements: name, description, and the “View More” button. Remember, we’ve just added a link in the backend slide configuration? It is used in the “View More” button. In our case, the slider displays two videos simultaneously. The “View More” link is available beneath each video in addition to a slide name. Thus, the UberTheme UB Content Slider Magento 2 module displays two slides simultaneously, but it may vary depending on screen size. The pagination is shown below. As you can see, UberTheme UB Content Slider Magento 2 extension is extremely easy to use. You need neither coding nor backend experience to configure the module. Everything is intuitive, so even a child can create a stunning slider (if you provide him or here with great images and videos of course) with the help of the tool. 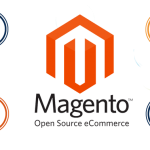 As for the price of the Magento 2 module, it costs only $99, so don’t hesitate to give it a go – it will help you make your Magento 2 website more appealing to customers.